Selina Her has been the principal harpist of the CYS Orchestra for five years. 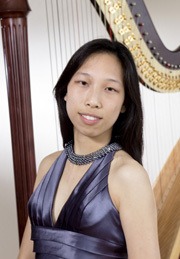 She attends Cupertino High School where she has performed many times on harp with the choir, often as a soloist. Her numerous other musical activities include El Camino Youth Symphony, Nova Vista Symphony, Polyphony Chamber Orchestra, Stanford Symphony Orchestra, Stanford Philharmonic Orchestra, and the Stanford Chorale. Selina has told us “in general, my philosophy is not geared toward participation in competitions but rather toward actually interacting and improving my community and the people in it, hence the emphasis on playing in public venues and with various ensembles.” These venues have included Aegis Living, Cancer Support Community, Filoli Gardens, Gamble Gardens, and Pathways Hospice. Her activities at school have included volleyball, president of the Music Club, California Scholarship Federation, and National Honor Society. For college she has yet to decide between Princeton, Stanford, and Yale.